The day has finally come folks. Google just unveiled the fifth iteration of the Nexus handset line-up; the Nexus 5. Like last year, behind the hardware part is LG, which designed the predecessor of the 5, the Nexus 4. Design wise the smartphone has been totally revamped, featuring a plastic back with a matte finish and the back facing camera being relocated to the top right-hand corner alongside with the LED flash. There is also LG and Nexus branding and FCC markings on the back. In addition to design, the speaker has been finally placed on the bottom of the device for it to sound clearer. The device also weighs 9 grammars less – 130 grams – compared to the 4, and features around the same body size. Engadget got their hands on the device and stated in the respective article that the handset feels premiere in the hands. The screen size has been increased as well, exhibiting a full HD IPS Plus 4.95-inch screen covered by the latest gen corning Gorilla Glass 3 – ~445 ppi pixel density. Above the screen the company placed a 1.3 megapixel secondary sensor and a speaker grille as well. The primary camera of the Nexus 5 maintained its megapixel number, though it now includes optical image stabilization (OIS) for reducing blur, captures multiple images at different exposures and combines them to bring the most detail possible. The new sensor can even compensate for motion when trying to capture a moving target. Spec wise underneath the hood the device packs – as we accurately predicted – Qualcomm’s latest gen processor the quad-core Snapdragon 800 clocked at 2.3GHz, coming alongside with an Adreno 330 GPU. Memory wise the Nexus 5 features 2GB of RAM. In terms of storage, the device comes in two editions, 16 and 32 GB, non-expandable. The battery has been slightly boosted to accommodate the integrated display, and now is 2,300 mAh – Nexus 4 features 2,100 mAh. The device now also supports 4G LTE. 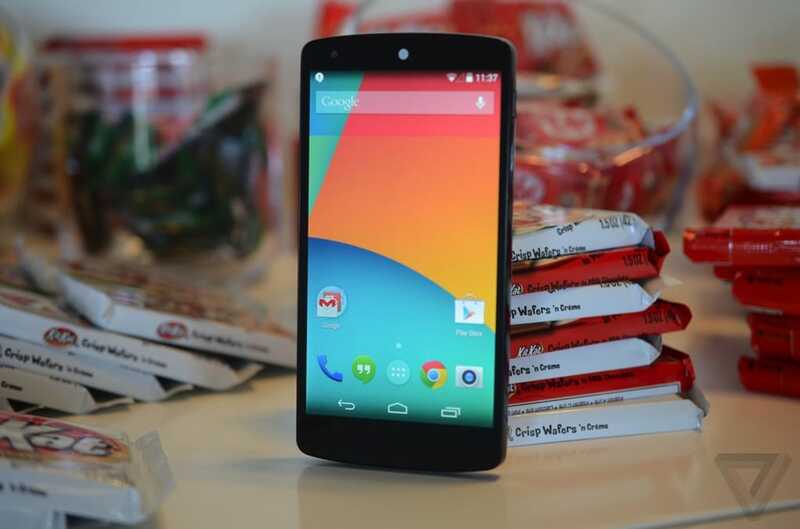 Finally, the Nexus 5 will ship with Android 4.4 KitKat out of the box. I don’t know if you guys have noticed but the software buttons bar is now transparent and the actual background is now displayed. Not something significant, though we thought it would be fun to mention it. This year Google will be releasing two different models: one made for EU and US, and the second one for Asia. Both devices will come in 16 and 32GB -black and white – flavors retailing $349 and $399 respectively. The device will certainly hit the US shelves before holidays, as for Europe we presume that the device will be available in all the countries by February. Nexus 5 has been sold out in less than two hours in the Play Store, though we expect Google to bring new stock pretty soon. Keep your eyes peeled. We wonder if you guys will pick one up. Whether it’s a yes or a no, let us know in the comment section below. If you ask me, the Nexus 5 is one hundred percent my next daily driver. Image thanks to the theverge.com. Orestes Papanastassiou is a reporter for Product Reviews Net, mainly focusing on the world of mobile and wireless technologies. He has a six-year experience in telecom and has been blogging since mid-2011. Pap resides in Salonica, Greece. The jury is out. If I get the Kit Kat update on my HTC One I may not drop the $350 or $400. The Nexus 5 won’t have superior sound and that’s why I bought the One. If HTC would release Sense 5.5 I would be in piggy Heaven!